Meet your new global consumerYouve heard of the burgeoning consumer markets in China and India that are driving the world economy. But do you know enough about these new consumers to convert them into customers? Do you know that: There will be nearly one billion middle-class consumers in China and India within the next ten years? More than 135 million Chinese and Indians will graduate from college… in this timeframe, compared to just 30 million in the United States? By 2020, 68 percent of Chinese households and 57 percent of Indian households will be in the middle and upper classes? 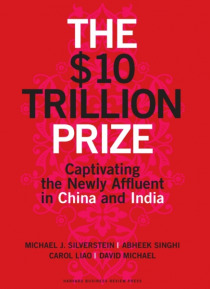 The number of billionaires in China has grown from 1 to 115 in the past decade alone?In The $10 Trillion Prize, bestselling author Michael J. Silverstein and his The Boston Consulting Group colleagues in China and India provide the first comprehensive profile of the emerging middle class, primed to transform the global marketplace. Already the worlds biggest buyers of cars, mobile phones, appliances, and more, these consumers are eager for more products and services. In fact, its estimated that by 2020, consumers in China and India will generate about $10 trillion of total annual revenue for companies selling to them.This book explains who these consumers arewhat they buy and why, how they think and shop, and how their needs and tastes are changing. It takes you into their lives so you can better understand what they want and what theyre looking for. Only by fully comprehending the forces driving this new generation of consumers will your company be able to capitalize on the opportunities their buying power represents. Insightful and backed by rigorous research, this book takes you inside the hearts and minds of todays emerging Chinese and Indian consumersboth urban and rural, and across all income levelspositioning your company to win as the next wave of global affluence reaches the marketplace.